Sony Ericsson has finalised the launch name (Satio) and date (October) for its flagship 12MP cameraphone codenamed Idou, announced at Mobile World Congress. 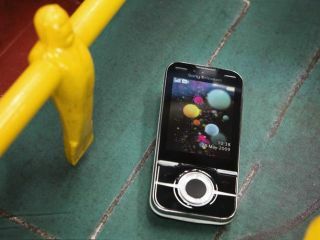 The 3.5-inch wide-format touchscreen handset includes A-GPS with Google Maps and geo-tagging and will run on Symbian S60 5th edition, as debuted on Nokia's 5800, but with a large number of Sony Ericsson tweaks and personalisations. Sony Ericsson has confirmed that the UMTS/HSPA handset will ship with a 8GB microSD card, and will be available in three colours (black, silver and bordeaux) this autumn. There's no price yet but check out TechRadar's in-depth hands on review of the new Satio. Two new phones were also unveiled today by the Swedish Japanese alliance. Yari is first mobile phone with gesture gaming outside of the Japanese market, introducing a games carousel that allows you to access pre-loaded motion and standard games from your desktop and to browse downloadable content on PlayNow arena. The 3G slider handset has dedicated gaming buttons together with "gesture and motion gaming for action on and off the screen", meaning your whole body is used to play a game using the forward facing camera. It has A-GPS, a geo-tagging autofocus 5MP camera, Wi-Fi, a QVGA 2.4-inch screen and a torch. Finally, the Aino is a 3G touch-phone with a 3-inch, 16 million colour. 240x432-pixel display. It's home to stereo Bluetooth, Wi-Fi, an autofocus 8.1MP camera, A-GPS and an 8GB memory card. Aino's key feature is Remote Play with Playstation 3, initially developed for PSP, enabling users to control and access media content on their PS3 from the phone, as well as Media Go, which automatically synchronises with your PC over Wi-Fi when clipped into the bundled charging dock. Both the Yari and Aino will be available in Q4 2009, likely at the beginning of October.